The Canecutters Memorial was erected by the Italian community of Innisfail, to commemorate the contribution of Italian migrants to the sugar industry, both as labourers and farm owners. The memorial was erected in 1959 after the Queensland Government suggested communities commemorate the centenary of separation from New South Wales by a structure of a permanent nature. The Canecutters or Pioneers of Sugar Industry memorial is important in demonstrating the evolution of Queensland`s history as an illustration of the significance of the sugar industry in North Queensland. For many years, the growth of Innisfail and the surrounding district was reliant on the sugar industry. 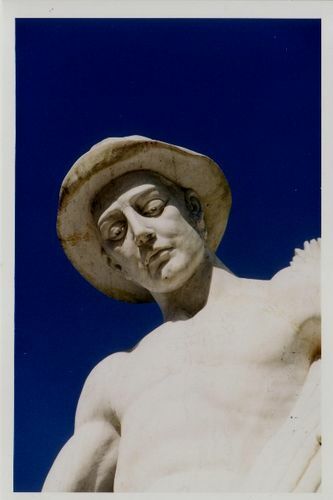 The subject of the Memorial, a canecutter, further demonstrates the evolution of Queensland`s history as a figure in the sugar industry made obsolete by the mechanisation of cane harvesting in the 1960s and 1970s. The life-sized white marble statue of a cane-cutter was unveiled at Innisfail, North Queensland, during the town's annual Sugar Week Festival. A memorial to sugar industry pioneers, the statue cost £5000. It was paid for by Innisfail's Italian community "as a mark of appreciation to the land of their adoption." The Australian Women's Weekly , 28 October 1959.